I wouldn’t call my self a fan of extreme sports. In fact, the most “extreme” activity you’ll likely find me doing is rocking out with my fake plastic guitar. So it’s not all that surprising to know that I’ve never been snowboarding or mountain biking. I do, however, know that in such activities you probably need stay focused on the task at hand. That’s why I don’t recommend this Bluetooth Sports Helmet for anyone in extreme sports. 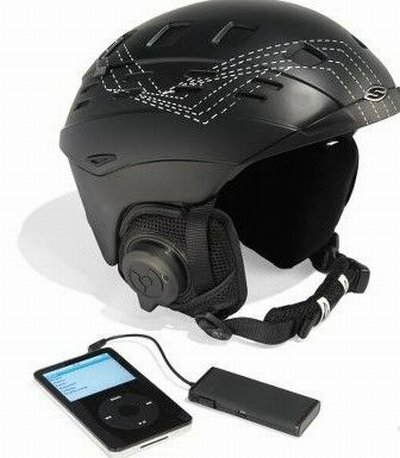 This helmet features an integrated Bluetooth headset, which is great for hooking up to your iPod with the included transmitter. The shell is made from an injection-molded ABS and a polycarbonat with an EPS foam liner. While listening to music may become distracting during some activities, you’re probably going to do it anyway. What’s good about this helmet is that it lacks wires which could potentially get in your way and cause further distraction. If you’re looking for a new helmet, and you simply must listen to your tunes, you can pick this one up for $300. I’ve got something similar at home, called a Giro Bad Lieutenant Helmet, no bluetooth, but it suonds great, and its not at all dsitracting. The cool part is you can usually integrate these things with a cellhone/headset/walkie-talkie, and answer calls on the hill hands-free. I am an avid skier and snowboarder, clocking 50+ days per year. I have a Giro helmet with integrated headphones and I listen to my music all day while on the slopes. Trust me, the above reviewer does not know what he is talking about when recommending to NOT listen to music while doing “extreme” activities like snowboarding or skiing. Maybe if its your first time out on the slopes you should concentrate on what you are doing. However, if you are an experienced rider, you quickly learn that, a song with a good beat enhances your rhythm and style on the slopes, and provides a great way to ignore everything but the snow crunching under your boards. you dont snowboard? then dont talk. Go do it first then see what you say. How ignorant do you have to be to say that you’ve never done something before, and then make recommendations to people who have? I listen to my iPod on the mountain all the time and its not a distraction at all. Sound isn’t really a necessity for snowboarding, if fact the music makes me more focused, if anything. I wonder if the author of this listens to his car stereo when he’s driving or if it’s too distracting? This guy Chris for sure needs to hit the slopes before he gets up on his soapbox and preaches anti-music. Lose your snow virginity man! But should we expect anything else from a contributor to a gadget website?